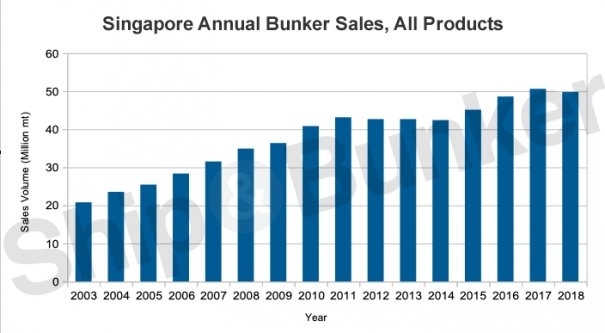 The Maritime and Port Authority of Singapore (MPA) has released its full year bunker sales figures for 2018 and the story in a nutshell for the world's biggest bunker market is "steady as she goes". The total was down very slightly (1.66%) year-on-year to 49,798,800 metric tonnes (mt), calls for bunkers slipped a little further (3.11%) to 39,471 in 2018 from 40,736 in the previous year, and the average stem size for the year edged up 1.45% to 1,262 mt vs 1,244 mt in 2017. While the overall total represents a dip under the psychologically significant 50 million metric tonne mark reached in 2017, the reality is 2018 goes down as the second best ever annual volume sold at the port having missed setting a new record by just 837,600 mt - a tiny amount in Singapore terms. Drilling into the sales detail also shows unremarkable change: Sales of IFO380, by far the most popular grade, fell slightly to 35.7 million mt vs 37.8 million mt in 2018. 500cSt sales edged up and took a larger slice of overall sales - 10.6 million mt & 21.3% of the overall total for 2018 vs 10.1 million mt & 19.9% in 2017. LSFO sales doubled year-on-year, albeit from 143,500 mt to 308,500 mt. Distillate sales grew from 2.12 million mt in 2017 to 2.29 million mt, with a slight shift towards LSMGO sales which represented 67% of distillate sales in 2018 compared to 60% in 2017. The IMO 2020 global 0.50% sulfur cap on marine fuel comes into force on January 1, 2020, and many vessels are likely to make the switch to compliant fuel starting mid-2019. So while no-one expects Singapore to lose its position as the world's biggest bunker port, volumes for the individual products sold is sure to be very different for the year ahead.